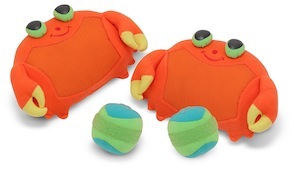 The Melissa & Doug - Crab Toss and Grip Outdoor Toy will provide children 3+ years old with lively entertainment at the beach or even in your own backyard. These Melissa and Doug outdoor toys include soft, self-stick mitts and balls for great outdoor fun. These Melissa & Doug toys also help develop hand-eye coordination for developing kids.